Where to begin. For starters, Rian Johnson had the unenviable position of following up The Force Awakens to present Star Wars audiences with the second movie in what has been deemed the sequel trilogy. The Force Awakens was a financial success making almost a billion dollars domestically. But Star Wars fans are always divided on the elements in their fandom, be it movies, books, television or video games. What one person loves, someone else will hate. To that end, we can only express our own opinions for what they’re worth. And to that end, we loved The Last Jedi. Full disclosure, we’re delving into complete spoilers for the film. Geralyn: and boy did we love it. I’ve spent the weekend reading a lot of polar opposite viewpoints of this movie from fans, but for me The Last Jedi returns Star Wars to its rightful firmament. I don’t like The Force Awakens. On a fundamental level it is a bad movie because it’s an insipid retread of A New Hope that, nevertheless, is somehow missing the essential Star Wars ethos. In The Last Jedi, Rian Johnson got right what J.J. Abrams couldn’t seem to grasp. In doing so Rian returned the Star Wars I love to me. Skuldren: On the flip side, I really liked The Force Awakens, so for me, The Last Jedi had to follow that success with a movie that was equally great or better. Just the other day, I went and re-watched The Force Awakens before going to see The Last Jedi again and it was a fun experience. While there is a difference between the two movies, they do work well together. From leaving off on the island to jumping to the evacuation at the Resistance base, the ending and pick up point for each film leads to one giant story experience. But it’s not just the story, the visual elements and the characters also bridge the two films very well. That said, The Last Jedi goes off in different directions. Geralyn: In a lot of ways this is a hard movie to discuss/review. Because it is so chock full of stuff we could be here all day talking about it so a traditional recap is out of the question. Suffice to say that Johnson’s opening sets up a dire situation for the Resistance. While the Resistance manages to escape their base right under the nose of the First Order, it does them little good as General Hux has figured out a way to track the Resistance ships through hyperspace. This opening sequence, however, does set Poe up for some dramatic action…and a very funny bit between him and Hux. However, Poe’s plan comes at a tremendous cost to the Resistance as it destroys every single one of their bombers. Poe pays the price for those bombers when Leia calls him out on his recklessness and then busts him in rank. And, while the plan succeeds, it’s to little avail since the Resistance cannot shake the First Order. Skuldren: One of the things I really enjoyed about this move was Poe. He has a major part in this movie. From the space battle in the beginning of the movie, the whole plot to rescue the Resistance fleet in the middle, and then the battle of Crait in the end, his character keeps popping up as part of the ongoing arc of the film. Throughout the whole thing, Poe is there, often alongside with Leia, establishing him as a key character. It was an enormous step forward for Poe who was little more than an interesting side character in The Force Awakens. Unlike Phasma, Poe has become important. 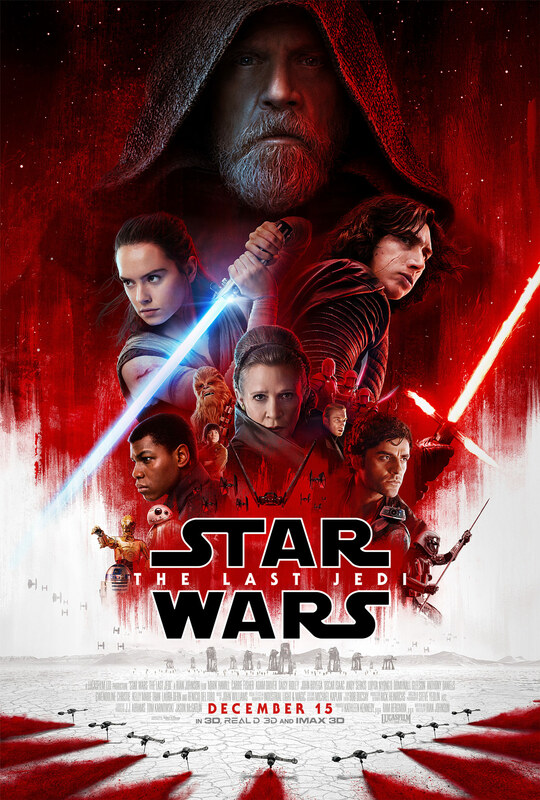 Geralyn: Poe’s expanded role in this movie is a great use of subverting traditional Star Wars tropes, and the subversion of those tropes is one of my favorite things about The Last Jedi. Almost the entirety of Luke and Rey’s interaction is a subversion of the Luke-Yoda trope. Just when you think Luke is playing hard to get ala Yoda in Empire, you realize he really means it. Luke has shared a fate with his first master. He has seen his strong apprentice fall to the dark side and destroy the Jedi Order. But unlike Obi-Wan, Luke has no hope for the future to believe in and watch over, and he has no belief in himself. When Luke goes into exile, he carries only his own failure and disillusionment. When hope finally appears, Luke is unable to truly accept that here is his redemption as well as his duty. His fear of Rey’s inherent power is really fear that he’ll fail again. Luke does indeed have his own darkness to deal with. Rey leaves him to seek answers elsewhere, but Luke is not completely abandoned. When he needs him the most, Luke’s second master is there for him. In one of the most touching scenes in the movie, Yoda once again shows Luke the way. With Yoda’s guidance, Luke finally fully understands Obi-Wan’s dying lesson to him on the Death Star. The circle is indeed complete. Skuldren: Ryan Johnson did a great job of giving all the characters interesting and entertaining storylines and moments. Whether it was a small character or a major role, everyone had a time to shine. But in the end, there is one role that stands out above all the others, and that’s the last Jedi himself, Luke Skywalker. Let’s face it, we watched on pins and needles as Kylo killed Luke with an army of First Order walkers. Then we cheered as Luke was still alive. This was the hero we’d been waiting for. All his reluctance to come back, his inner turmoil with the mistakes of the past, it was all wiped away as he finally made his return. And each moment was glorious. From his shadowed entrance when all hope was lost, to his heart warming reunion with Leia, to the epic showdown as one man with a laser sword stood down the entire First Order. Each moment was iconic and beautifully shot, written and acted. Yet at the end of it all, when it looked like Luke might yet live still despite being shot, cut in half and worn down by a tremendous use of the Force, he became one with the Force. In that moment, we lost another icon, and yet, it was so peaceful. The gut wrenching pain of Han’s death wasn’t there. There was shock, but there was also acceptance and beauty. In tackling such an impossible task, I think Rian Johnson did a spectacular job. Whether you have George Lucas at the helm or a new breed of writer and directors, it’s impossible to capture the same magic of the Star Wars films that brought us into this fandom. Part of that is because we are such a wide and varied fandom. For those who cannot agree which film is the best, or which trilogy for that matter, we have to come to terms that we’re not all going to agree with the new Star Wars films that come out. Some will enjoy them more than others, and we’re sure to have our gripes and complaints. Thankfully, Geralyn and I found a lot of enjoyment in The Last Jedi. For us, this film just clicked. Everything came together and worked, providing a great storytelling and film experience. We give it a five out of five metal bikinis. Reviewed By: Geralyn and Skuldren. Geralyn: Oh my goodness is Mark Hamill outstanding in this movie. He gave an Oscar-worthy performance. The trope subversion was such a refreshing experience in a Star Wars movie. I can’t remember the last time Star Wars actually surprised me. I love the fact that Rey is a nobody. I really hope Abrams doesn’t change that. After all, in the grand scheme of the galaxy, the Skywalkers are but an instant in time. When Finn opened the drawer to retrieve the blanket for Rose, I laughed because I realized that Yoda had been speaking quite literally when he told Luke that Rey had the knowledge. No Jedi master metaphorical speak there. Domhnall Gleason — I don’t know which one of us had more fun: me watching his over the top Hux or him doing his over the top Hux, but it sure looked like Gleason was having the time of his life in this movie. The whole scene between Luke and Leia was so poignant and bittersweet — a farewell scene on so many different levels. If you don’t like the Canto Bight part, bite me. It wouldn’t be a Star Wars movie without a goofy, weird and somewhat (but not altogether) useless bit that also has strange creatures in it. In fact I hope Abrams doubles down and puts a Canto Bight scenario in Ep IX. Also Canto Bight was a setup for that wonderful last scene in the movie so that alone validates it. I get that the movie had its issues. I don’t care. It’s impossible to sound like an adult while complaining that this movie ruined your childhood. Skuldren: Dense. This movie is dense, and that’s one of the key reasons why you hear people talking about going to see it again and getting a different experience out of it. There is a lot in this movie, and if you don’t know where it is going, it’s easy to miss some of the details and clues the first time. I know I didn’t spot the boy grabbing the broom with the Force until my fourth viewing. And the little floating alien poodle in Canto Bight (not Gary the dog), I didn’t catch that until my fifth viewing. What of the funnest things about this movie is the what if factor. What if Poe obeyed Leia in the beginning of the movie and the Resistance was able to escape with their bomber squadrons? What if Holdo had simply broke down and told Poe the plan about Crait instead of withholding that from him? What if Rose and Finn got the Master Codebreaker instead of DJ? Following those rabbit holes can be a lot of fun. Holdo’s hyperspace kamikaze attack was jaw dropping…but it’s also a dangerous maneuver that could break the logic of the franchise. That said, it’s totally fixable and hopefully the Story Group will provide a worthwhile explanation on why this isn’t used more often. I’m predicting we haven’t seen the last of the Supremacy (Snoke’s mega ship) or Luke Skywalker for that matter. And to wrap things up, can we all agree that Captain Canady was cool? If there was one First Order officer in this movie who felt like he knew what he was doing, it was him. He might not have scrambled his TIE fighters in time, but he didn’t cower in the face of death. He went down with his ship with a little snarl for the Rebel scum who bested him. To Captain Canady, we pour one out. May the First Order find some more good officers like him for Episode IX.